Could you triple the amount of time you currently practice guitar each day? When you do, you accelerate your progress without increasing your practice time. And the best part? It’s easy to do. You know how some guitarists set long-term, medium-term and short-term musical goals? You can also set micro goals. These are tiny objectives you plan to achieve every time you practice your guitar. You can set micro goals for every area of your guitar playing (not just guitar technique or speed). Practice delayed vibrato (as shown in the video) for 15 minutes and make the vibrato speed consistent for each note. Ultra-specific (the more specific – the better). Realistic to achieve in ONE practice session. Want to learn more about setting micro goals and getting the most from your practice time? Take this free guitar practice test & learn how to squeeze more progress from each minute of your practice time. How can you make your guitar practice schedules as effective as possible? Plan what you are going to practice before you pick up your guitar. …and plan your practice schedules several days in advance. Different guitar playing need to be practiced in different ways. Guitar technique is best practiced daily, in moderate amounts of time. Non-guitar playing skills (such as ear training & fretboard knowledge) are best practiced multiple times per day, in short blocks of time. Creative skills (such as improvising or songwriting) are best practiced less frequently, but for longer periods of time per practice session. There is no good way to practice all of these skills in a single practice session. When you plan out your practice schedules for several days in advance, you can include all the skills you need to work on and ensure that nothing is overlooked. This is how you get the most from each minute of your practice time. 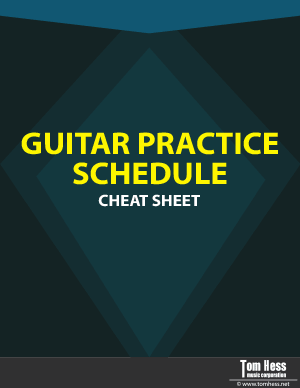 To learn more about creating effective practice schedules, download this guitar practice cheat sheet. (It’s free and you don’t need to enter an email address). Use it to create practice schedules that help you improve fast. What is the engine of your guitar practice? What your brain focuses on determines how much (or how little) progress you make in every practice session. Free your brain from distractions that slow down your progress. Focus like a laser on the things that help you improve your guitar playing. One easy way to free up your brain is to use a timer when you practice. Set it to count down the number of minutes you practice a particular item… and begin practicing. You become more able to focus on practicing (instead of worrying about how much time you have left). You feel more committed to follow through and practice the entire time the timer is going. You avoid over (or under) practicing items in your schedule. Want to know another cool way to free up your brain? Fully master the motions of each hand. This means: don’t rely on the motions of one hand to tell the other hand want to do. You’d be SHOCKED at how common (and damaging) of a problem this can be. The more you enjoy practicing, the more likely you are to practice consistently. The more consistently you practice, the faster you reach your goals. The faster you reach your goals, the more you will enjoy practicing. Tip #1: Strive To Improve, Not To Play Perfectly. Don’t worry about playing something perfectly today. Focus on making your playing better each time you practice. The gains you make through daily practice add up to making you play things perfectly. This attitude takes away a lot of (unnecessary) pressure and makes practicing more effective (and fun). Tip #2: Train Your Creativity. Yes, creativity can be practiced and improved, like any other area of your guitar playing. Schedule time for it and practice it. The more creative you become, the more you feel like a musician instead of just a guitar player. Don’t be the guitarist who only practices technique and exercises, but never learns to make music with them. Tracking your progress turns guitar practice into a fun game where you keep score. It also gives you clarity on what is and isn’t working in your guitar practice… so you can do more of the things that make you better. Isolation practice – this is where you practice an item outside of any musical context. Application practice – this is where you use your item in a musical context. Integration practice – this is where you combine your item with other musical skills, techniques and concepts you know. Focus your guitar practice on all 3 layers at the same time. Do not wait to master something in isolation to begin practicing application and integration. Begin to apply what you are practicing even before you have mastered it in isolation. Yes, it will feel imperfect and yes, you will make more mistakes (at first). Your mistakes make you more aware of what to focus on during your isolation practice. This accelerates your progress and speeds up the process of reaching total mastery. You now know how to make your guitar practice more effective than ever before. The next step is to create guitar practice schedules that take all the guesswork & frustration from practicing guitar. Take this guitar practice quiz and learn how to make guitar practice the most enjoyable part of your day. 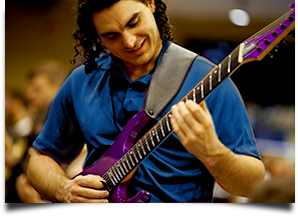 Use effective guitar practice schedules to improve your guitar playing faster than ever before.